In the wise words of Moana's Tamatoa, "Make it look shiny!" 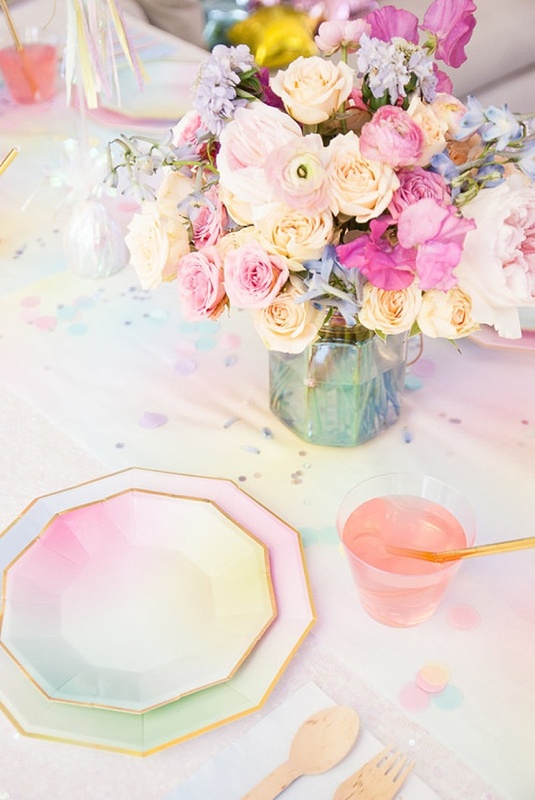 With the ongoing trend of mermaids and unicorns, iridescence gets the wedding touch through stationery, florals, cakes, and all things celebration. Precious stones like opals and pearls get the spotlight while pastels take on a shimmery hue. 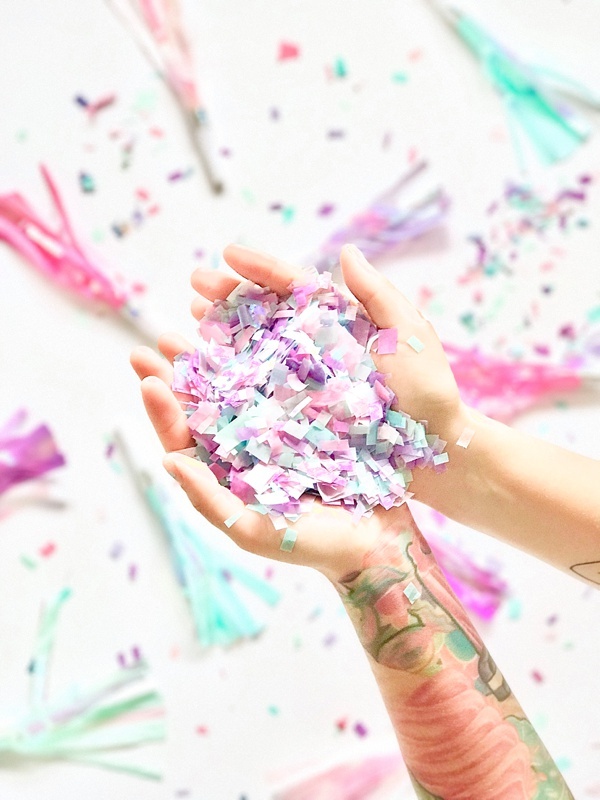 And well, anything that sparkles and gleams is practically destined for weddings, so we will certainly see more iridescence pop up whether it's the big day, bachelorette parties, or even wedding showers. Curated from Etsy and from our fellow wedding editors, we found the most inspiring ideas for any couple who looking to shine. 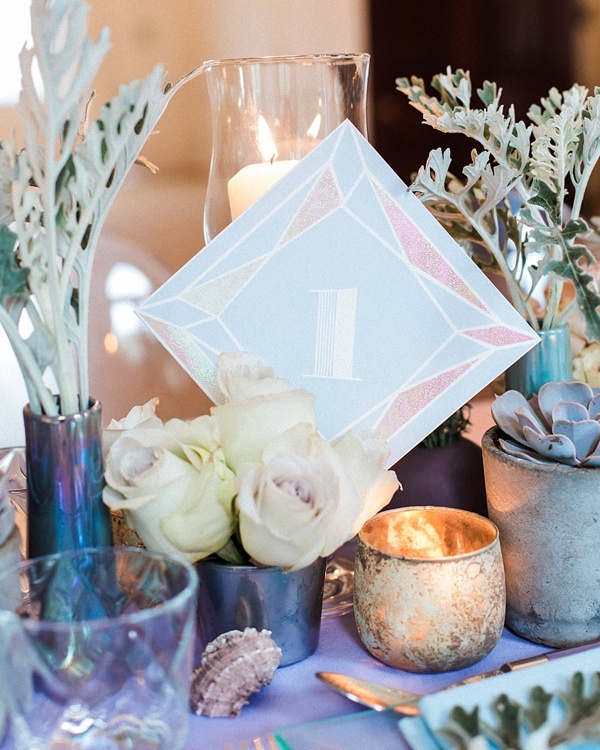 Delightfully coastal and mermaid-channeling, these pastel table numbers with a touch of geometric shimmer are paired perfectly with succulents and dusty millers. Dress up your blooms with a few glass bubbles and translucent beads with an opalescent shine. 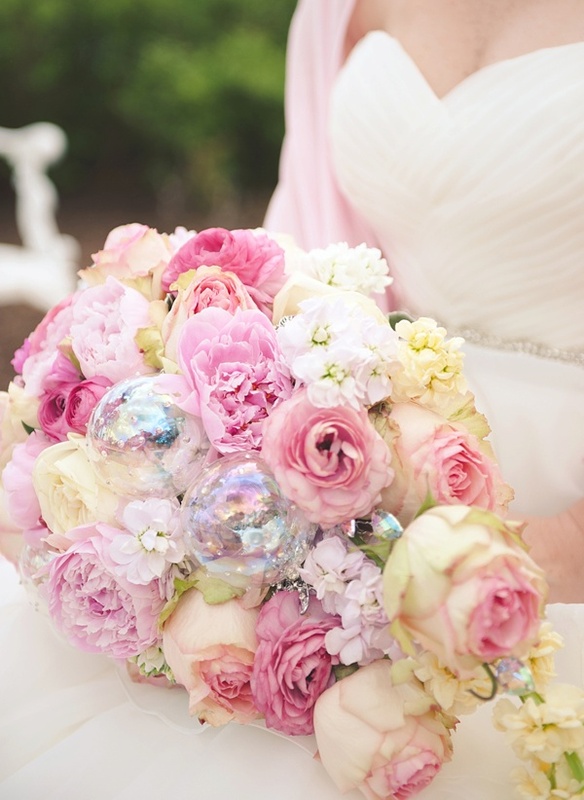 We love the whimsy feel to this bouquet for any bride looking for a subtle shimmer! 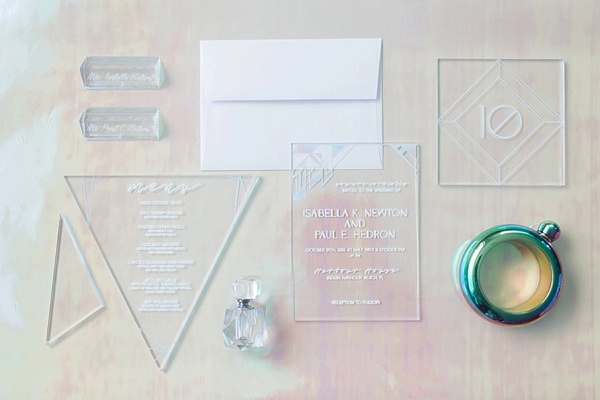 With a fresh spin on the acrylic trend, add a little iridescence to your wedding invitations! 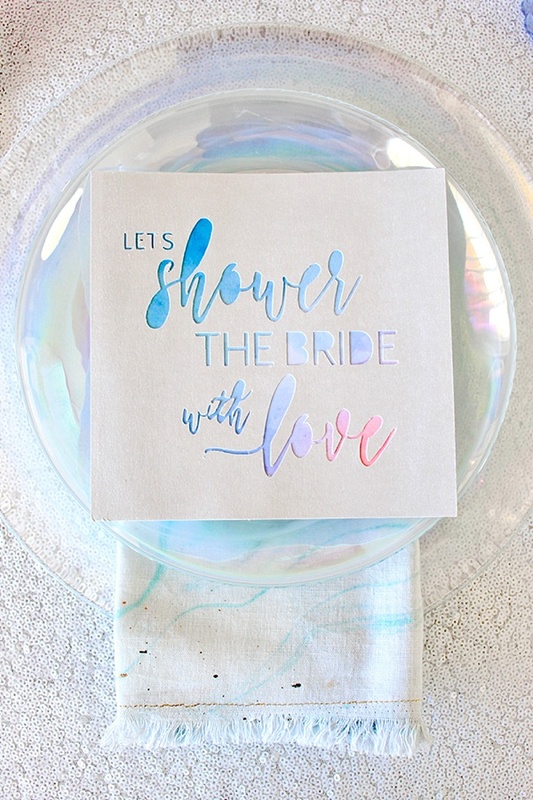 A touch of rainbow pearliness can give a modern or quirky aesthetic to the big day's theme. Hip hip hooray with shiny confetti! 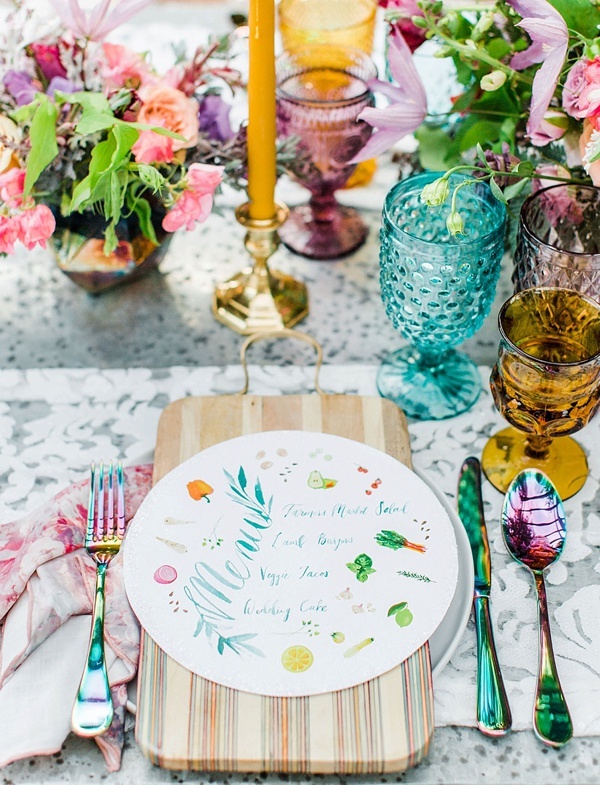 Eco-friendly without the mylar, this playful toss idea could be just what your wedding needs! Love iridescence but prefer a moodier look? This set of dark shimmery flatware might just be the look you're envisioning on your reception tables. Wrap it up, friends! 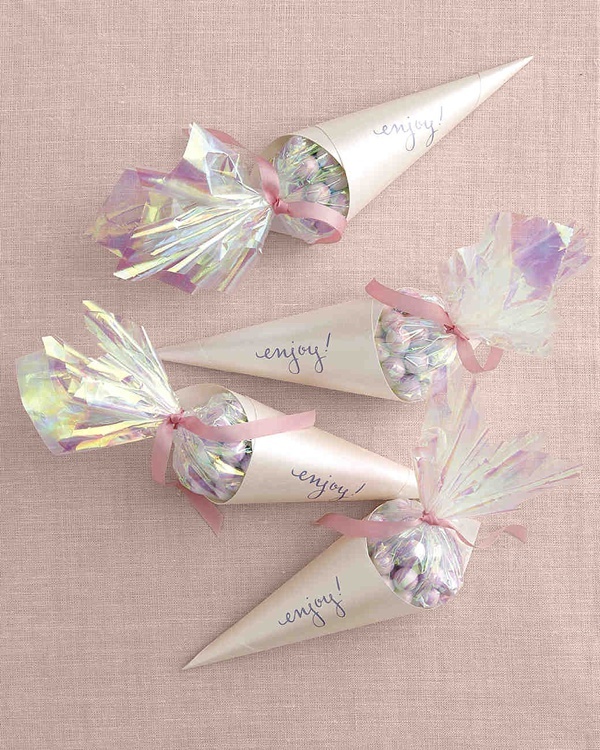 Give out iridescent wedding favors with mylar film, opal cardstock, and white chocolate pearls for a sweet tweet. Even vintage brides and bridesmaids can get the iridescent treatment! 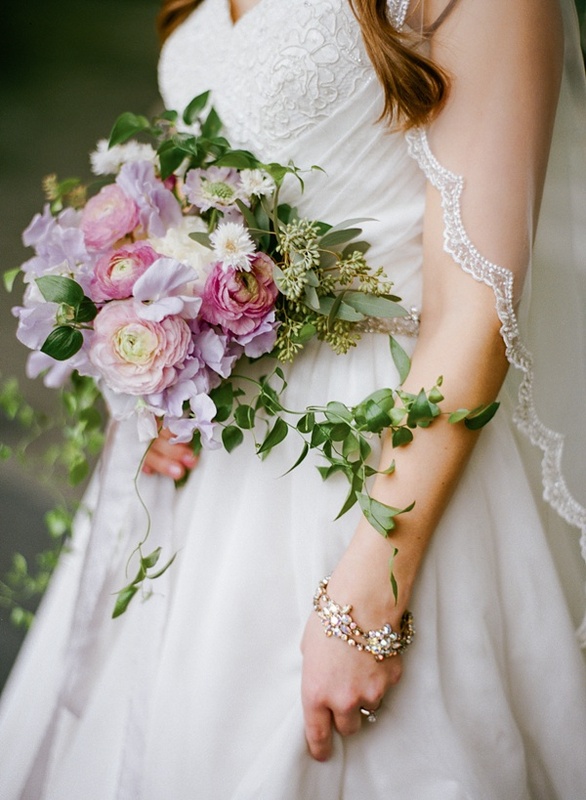 Old world-inspired bracelets and earrings that give a pastel glow will keep your timeless look for your modern wedding. 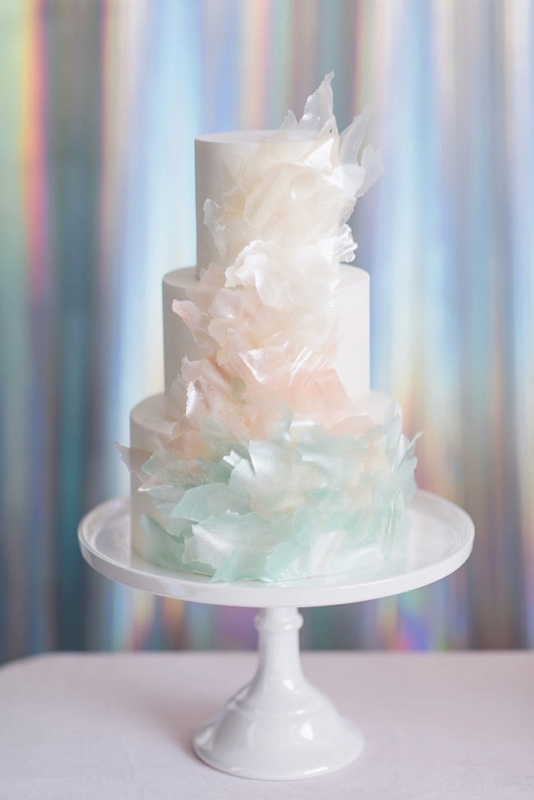 Get your craft on and make this adorable white opalescent wedding cake piñata DIY project! Sans the rainbow colors, this type of iridescence is ultra chic and adaptable for any wedding party theme. If you're looking to go full on pastel to complement the iridescence, explore iridescent glass like this floral centerpiece vase! We love the shimmer with all those colors! 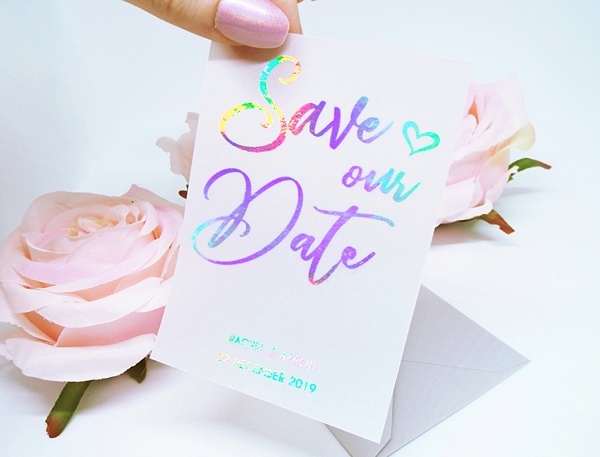 Prep your guests for a colorful celebration with these adorable iridescent save the dates. Say goodbye to gold or silver foil, and embrace the rainbow look! Step out on the town in this fabulous mini white iridescent dress with your ladies! It's the ultimate look for any mermaid bride. Be still our laser cut hearts! 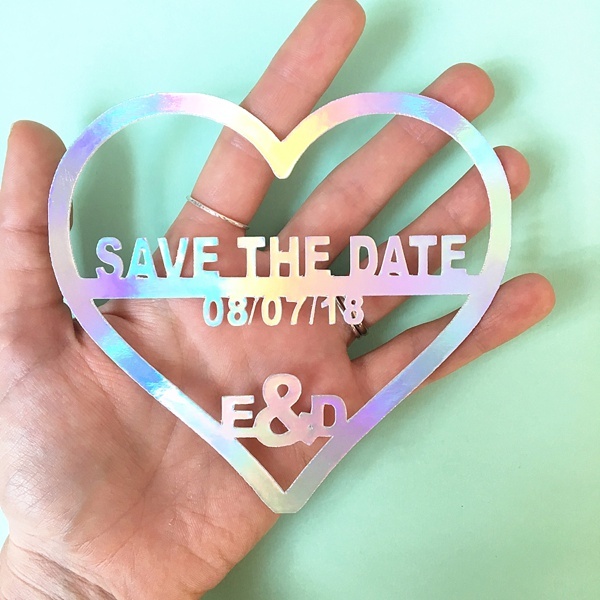 We love this unique non-paper holographic option for a save the date. It reminds us of music CDs before everything went digital! Throwback Thursday! Oh that chandy! Imagine an entire room filled with these iridescent beauties, and let everyone swoon over the Instagramability of it all. 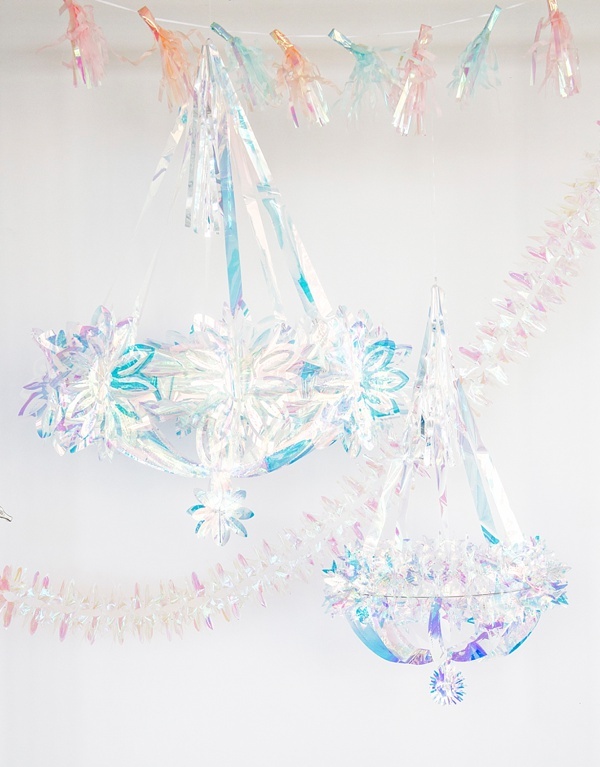 Photography: Alexa Marie Photography | Party Supplies: Jollity and Co.
Holographic fabric backdrop? Check. Shimmery opal-inspired sugar details? Check. Most gorgeous iridescent cake ever? Double check. and Shop Our Favorite Shimmery Finds!